There have been many SEO related changes during the past years – the best examples being the dwindling relevance of PageRank, content freshness, the focus on backlink quality as opposed to quantity and the increased importance of page load speed, all of which have had a significant impact on a lot of websites. Nevertheless, core of the SEO has mostly remained the same – all the rules and best practices that applied in 2004 can safely be used today in order to make your website more attractive to search engines and people alike. Proper titles and headings, relevant and unique content, backlinks from other websites, a reasonable amount of ads (not a dozen banners on a single page) – all of these are just as important nowadays as they were back then. Today we will talk about content freshness and why google cares about it so much. The past couple of years we’ve seen Google trying to adapt to the so-called Web 2.5, where social networks are just as important as search engines – with Facebook getting more daily views than Google’s home page, that’s not a surprise. The main resulting change is a significantly increased bias towards content freshness, which is now ranked almost unfairly high compared to pages that have been around for a while and haven’t been updated, even though their content is still completely relevant. Google consistently ranks active forums, social media groups, news blogs and other frequently updated websites higher than the competition, not even paying attention to the other important SEO factors. They even have a special News section that completely ignores the normal ranking system at the top of relevant queries – and the big thing is that anyone can submit their blog if it matches Google’s criteria! Update your blog often. This one seems obvious and is pretty hard to accomplish if your site is in a niche that doesn’t get news often, but if possible, you should update your blog with fresh content on a regular basis (daily or at the very least weekly). This will have a double impact on the site’s ranking in Google: one, it will show the search engine that your site is actively maintained (i.e. not abandoned), and two, it will make it possible for your latest articles to rank higher than other websites, regardless of their other authority factors. Use video content. If possible, create videos, post them on Youtube and embed them on your website. You may already know that videos rank higher than posts for a lot of keywords, but what you might not know is that Google also ranks websites with embedded videos higher, as well – particularly if they were posted recently. Create an ongoing series of posts. If you’re aiming to rank for a specific keyword or a whole family of medium and long tail keywords, creating an ongoing series of articles is a great way to take advantage of the content freshness factor. You can post them on a regular basis (either manually or on an automated schedule) and Google will start indexing them right away – allowing the pages to rank high for the keywords you are targeting. Bring your old posts up-to-date. If you don’t think you’ll be able to constantly fill your blog with new articles on a recurring schedule, you can simply update your existing posts – add the latest developments in the niche, more related and useful links, answers to user questions and anything else related to the article, niche and keywords. Google’s crawlers do revisit existing pages on a regular basis, and if they notice your posts have new content added on a regular basis, they will visit more often and prompt the algorithm to rank the articles higher based on the content freshness. The timestamp of the post (which is automatically appended by WordPress, Blogger, Typepad and most other blogging platforms) plays an important role in this, as well, so make sure it’s updated. In fact, if you’re willing to go full blackhat, you can simply update the timestamps of your articles on a regular basis, without actually adding any new content – the trick has been proven to work, however you should know that many SEO experts (including Moz’s Rand Fishkin) suggest that it is a bad long term strategy since it’s really easy for Google to weed out this kind of “fresh” content. 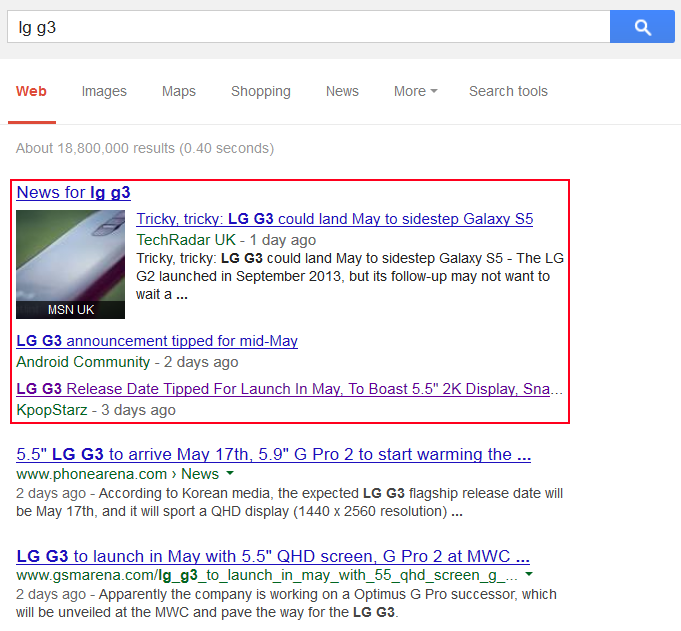 Submit your blog to Google News. If you own a relatively established blog (6+ months old, over 100 articles written, properly SEO optimized and of course frequently updated), you can try submitting it to Google News – which in my opinion, one of the best things to come out of Google’s quest for content freshness and one of the best ways to get extra traffic at no cost. Google News has been a separate product of Google (in fact, it still is at news.google.com), but the company has integrated it into Google Search and is now displaying the latest posts from blogs and news sites that they’ve approved for a large number of searches. The great thing about it is that anyone with a good blog can apply and be accepted – there’s really no reason not to try. Before submitting your blog, you should read the guidelines on this page: https://support.google.com/news/publisher/answer/40787?hl=en , and of course, your blog must be properly optimized for search engines on all other accounts (proper headings and tags, good usability, unique content, backlinks from other sites, etc.). – And most importantly, you need to provide detailed author information – at the very least an “Author Info” box with the author’s name, expertise and contact info – but ideally, you’d have a Google+ profile linked to the posts, so the author information also appears in search results (giving them more credibility, as well). The benefits of having your blog accepted for Google News are numerous – you get more traffic, you rank in the top 5 for highly competitive keywords (because News items are above organic search, the usual SEO rules don’t apply), you get more backlinks from websites who republish your content, and more. It’s truly a great opportunity – but be sure your site follows all the guidelines before applying, because if rejected, you’ll have to wait 60 days before being able to reapply. Google’s desire to get fresh content in front of their users might be a bit over the top at the moment, but it’s definitely here to stay – it is only prudent that you adapt and use it to your benefit. As you can see, it’s not that difficult to integrate content freshness into your SEO strategy, and you should do it as soon as possible if you want your sites to get an edge over the competition now and in the future.